This must simply be the best time of the year to visit Hozantei,and we couldn`t resist spending a while exploring the various nooks and crannies of the garden and its central pond before heading off to the baths. Although this season can be busy in Kurokawa we were bathing around lunchtime,so there were few other visitors. Hozantei was well-equipped, with a fairly modern shower area,(shampoo,conditioner and body soap provided) lockers,hairdryer and a toilet in the changing room area. The rocky outdoor bath is divided into three pools,pretty hot,warm and cold…a nice idea if you are not keen on a piping hot bathing experience or,as my friend commented,if you are with children or perhaps wanting to try bathing in the hot summer months. Also,the mildly acidic waters here are suitable for all skin types and may help fight fatigue and insomnia. The location by the river provides the prefect backdrop while you bathe. Hot bath on the left,warm on the right and cold in the far corner. UPDATE (March 2017). Ichinoi Ryokan and baths will be closed until later this year while repair work continues on the bathing areas. We apologise for any inconvenience caused. A short,but uphill, stroll from the Visitor Center made me feel as if I had at least earned a relaxing dip at Ryokan Ichinoi (旅館壱の井,number 11 on the English Map). The road was narrow,and lined with bright and cheerful cosmos daisies. The outdoor baths are reached by two flights of stone steps outside that I wouldn`t really want to try negotiating in the dark or wearing `geta`. It was a weekday morning when I visited,hardly any other onsen-goers around, and within a minute or two of having my card stamped I was already in the bath. The main thing that struck me here was the eggy smell and the floaty white deposits in the water associated with a suphur hot spring. Although the facilities here are quite basic,with no washing area,soap or shampoo provided, this `no-frills` hot spring felt like the `real thing` and the smell lingered on my skin for some hours after. 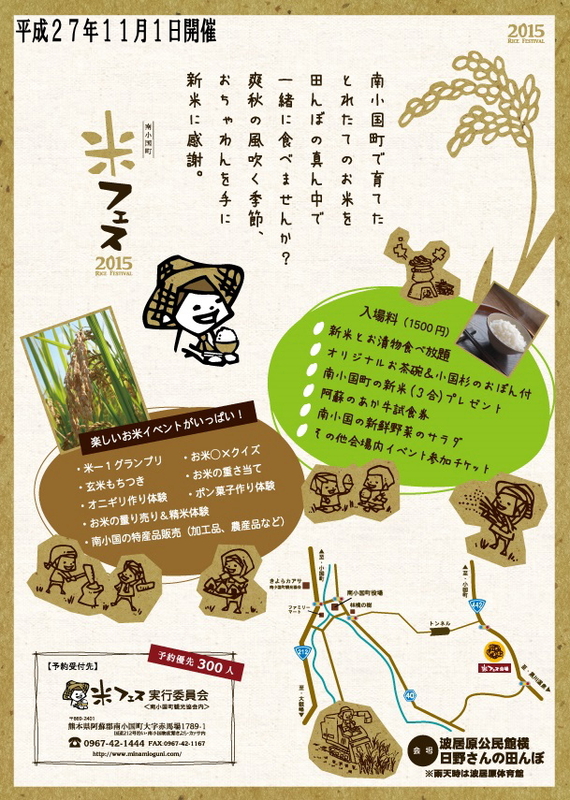 If you would like to learn more about RICE ( harvesting,cooking,eating and more) and happen to be in the Minami Oguni area on Sunday ,November 1st why not come along to this year`s Rice Festival (Kome Fes 米フェス in Japanese）. There will be rice pounding (mochitsuki) ,onigiri riceball making,popped rice,quizzes,locally-produced goods and more! UPDATE (March 2017) Due to damage caused during the April 2016 Kumamoto earthquakes,Nanjyoen Ryokan and baths have been demolished and rebuilding work is currently underway. Work is estimated to take almost 2 years from now. Although today`s Onsen-hop at Ryokan Nanjyoen (旅館南城苑　number 9 on the English Guide map) really was just a HOP across from the Visitor Center, it involved a lot of STEPS before I could finally JUMP into the bath. ( Hop,step and jump! Get it?!) However it is ideal if you are milling around the Visitor Center and are perhaps short of time (as I was today) ,but want to take a quick dip nearby to warm up. Follow the flight of stone steps that lead off from the car park down to reception,then once inside follow another flight of wooden stairs down to the bathing area. The men`s and women`s baths are swapped over daily,so today I was bathing on a kind of balcony that caught the rays of late afternoon sun beautifully. Try the facial sauna…I dare you! One of the known beneficial effects of the Chloride and Sulphate spring waters here at Nanjyoen is helping the body retain heat,and I did actually feel a sort of inner warmth in the core of my body for several hours afterwards… I don`t think it was solely due to inhaling that lungful of steam out of the facial sauna tank! Would I visit again? Yes, to warm up on a winter`s day.